Korbell’s powder-scented nappy bin liners are both sturdy and stretch-resistant to securely hold your dirty nappies without breaking, tearing or falling apart. Our nappy bin refills feature a unique, continuous roll, giving you the flexibility to create nappy bags of different sizes. There’s no wasted liner material when you want to empty the unit before it is full. 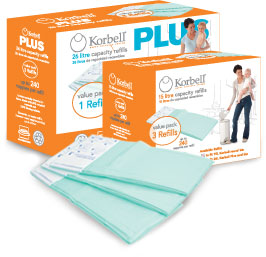 Plus, Korbell doesn’t waste bin liner material by individually wrapping each nappy, resulting in additional savings for users. Korbell’s 100% biodegradable nappy bin liners are the most environmentally friendly solution available. are made with 20% recycled materials. Open your Korbell and pull the full bag downwards. Cut the full bag on the door-mounted safety cutter and then dispose. Tie a knot at the bottom of the refill and close the door. That’s it!